The Avada theme is the best-selling WordPress theme ever, and we develop more Avada sites than anyone we know. We are truly Avada Theme Experts. Is your Avada theme support expired? Stop using support forums, opening forum posts, waiting for days and getting an answer to a question you were not asking. Ask for help and get it right away. Using our chat client or the plain old telephone, we can handle most Avada theme issues in minutes for our clients. Immediate fixes while you watch means less time wasted building your site, more time selling your product or service. Our US-based Avada support team works only on the Avada theme. What does this mean to you? It means that most fixes and customizations can be done inside of the Fusion Builder or Theme Options framework, instead of modifying the theme files. No child themes, no more changes that get lost every time the theme updates. Want to give us a try? Contact us by our chat client or telephone below for a free fix on your first Avada Theme support ticket! Let the Avada Theme Experts Take Care of Your.. Most economy hosting is not set up for Avada. Getting error messages can be frustrating. If you need some help getting the Avada theme installed, reach out. 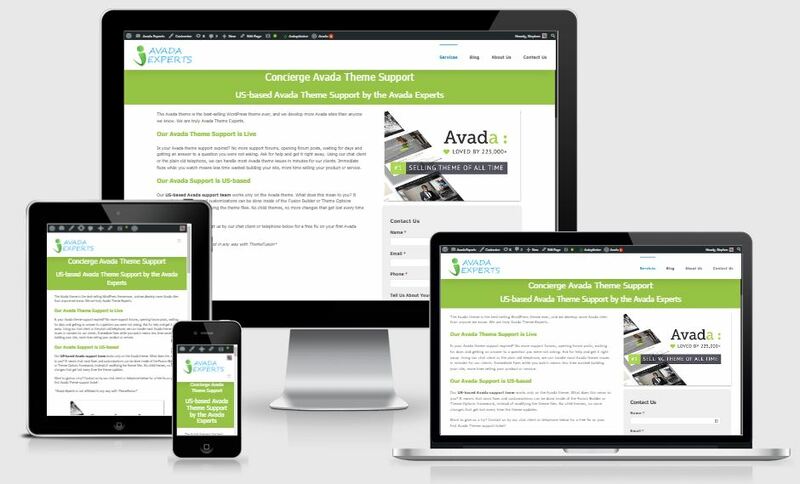 Want some help getting the Avada demo themes installed and personalized for your new website? Does your new Avada demo theme look different than you thought? Do you need someone to walk you through the Avada global settings or duplicate a style you can’t quite copy? We can do it for you, or walk you through it. Gravity Forms works great with the Avada theme, but it can be difficult to get it working properly. If you want a custom layout or need help with Gravity Form settings, let us help. The Avada theme can do just about anything out of the box, but if you need customization, we can deliver it same day, every day. Want hosting built just for Avada? Our Avada hosting includes site migration, daily backups, plugin and theme updates, and maintenance for your site at one low price. - Rated 4.8 / 5.0 for Avada Theme Support by 212+ Avada Theme Support clients on 217+ Projects.